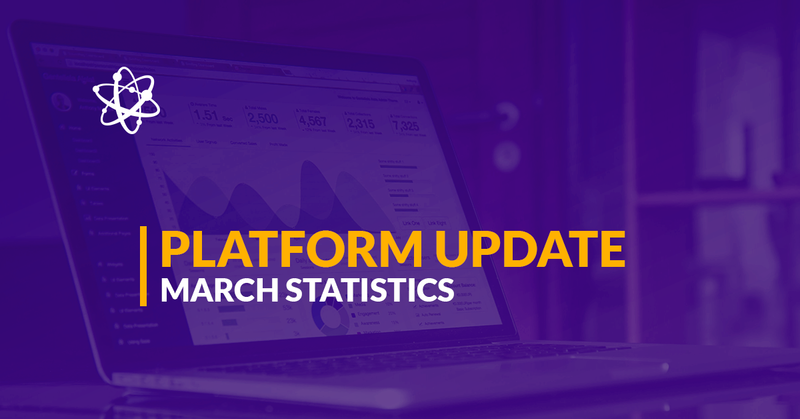 In our blog post, where we reviewed how our platform performed last year, we mentioned what percentage of assets were funded in specific industries. The most popular were Wholesale, Services, Retail, Manufacturing, Logistics, ITT, Construction. We want to share the chart with you again and then, stress why investors should pay more attention to the overlooked Manufacturing industry. One can see that investors preferred Construction sector and neglected Manufacturing even though interest rates for the assets were not among the lowest. 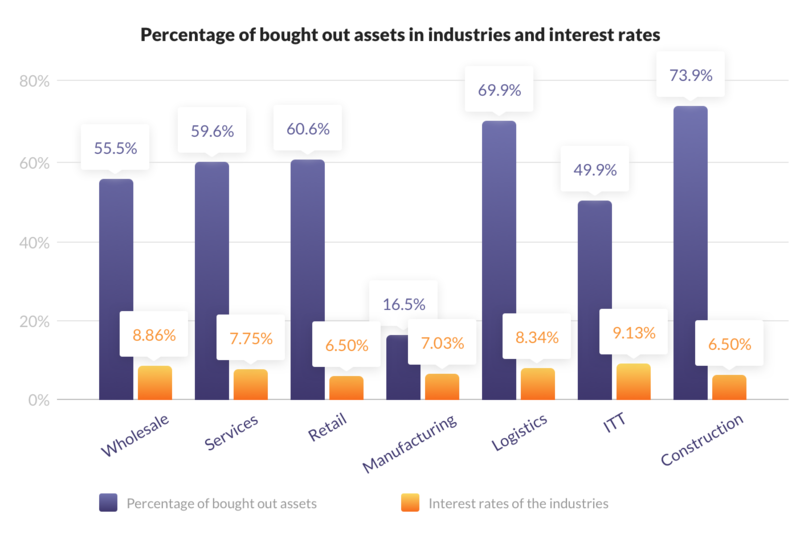 Only 16.5% of the assets in the industry were bought out. This represents investors’ choice, but by no means, it proves that the assets in the industry are worse than the assets in any other industry and we want to prove that they are safe and worth investing in. Manufacturing assets on our platform have some of the highest credit scores among the available industries. They range from B+ to B. It means, that according to our risk rating partner Scorify (a veteran expert in the field) the assets are the least risky investment options and could be the best investment choice for a conservative investor. Extra safety is added to the assets in the industry by the buyback guarantee. A buyback guarantee means that if the borrower is late with repayment of the given asset by a specific number of days set by loan originator (in most cases it is 90 days, but it depends on the loan originator), the broker (loan originator) who issued the loan has to buy it back together with the outstanding principal and interest. 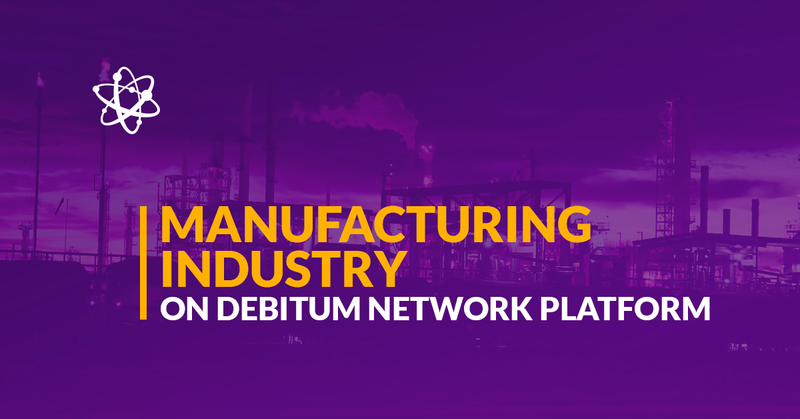 Taking into account, that all the assets uploaded on Debitum Network platform are carefully handpicked by our partners loan originators, the likelihood of a default is very small and even if that happens, investors’ funds are protected under the buyback guarantee. Not only brokers offer guarantees to protect investors’ funds, but also companies that borrow. The most typical guarantees that the companies may offer while taking a loan would be: personal guarantee (from 2-4 owners of the company), invoices for the goods sold, equipment (warehouse, machinery, cars, and etc.) to name a few. 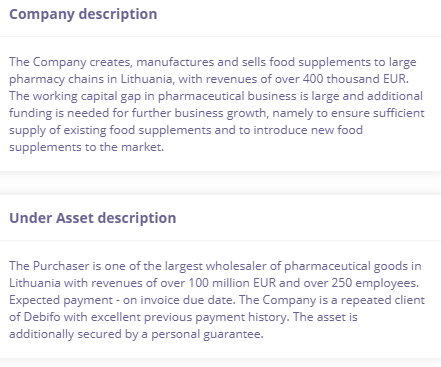 Companies that borrow and whose assets are uploaded on our platform usually offer their services to other companies. The latter are strong businesses with revenues exceeding 100 million Euros, huge customer line and over a decade of experience in business. In most cases, they are also regular customers of our loan originators, which proves that they are reliable business partners and will pay invoices. Borrowers in the industry of Manufacturing that have their loans uploaded on our platform have been in business from 10 to 25 years. Their revenues are steady, they have borrowed from our loan originators before, and have successfully repaid their debts. They are well-established players in their field and steady revenues diminish the chance that they will come short on their payments. The same is true about purchasers of invoices. 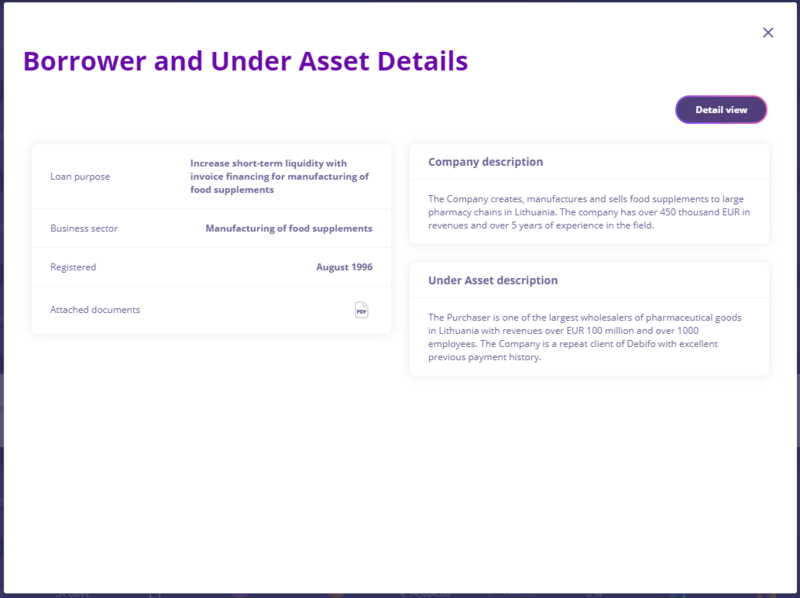 You can find that on your own by reading Under Asset description, which each asset page has. 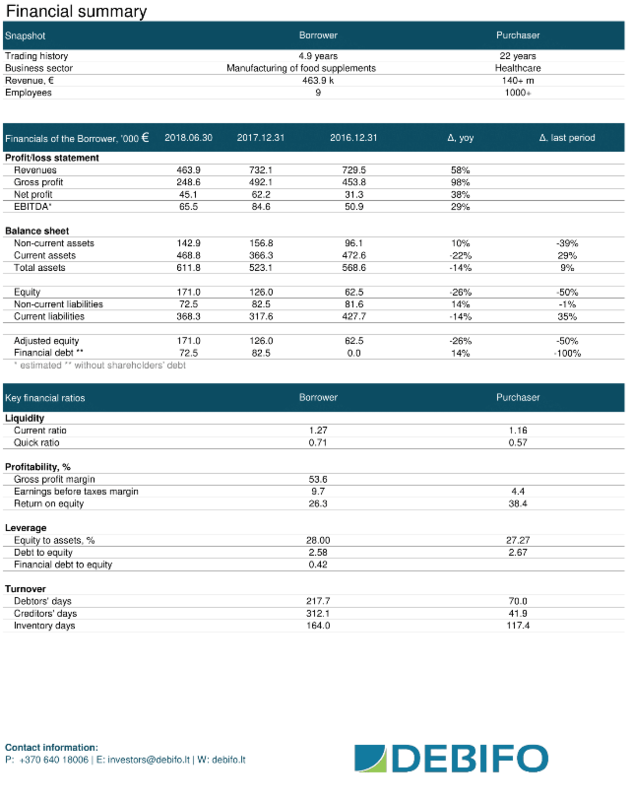 If you are a numbers person and want to find out more about specific investment or the company that borrows, what it does, its’ financial statement, you should press ‘View’ button and ‘Asset Detail View’ window will pop up. Press ‘Borrower & under asset details’ and you will find the purpose for taking a loan, what sector the borrowing company is in, when it is registered, more description about the company (some numbers, experience in the field) and Under Asset description (usually info about the purchaser about the final buyer of the invoices). You may find even more useful info and benefits (not discussed above) of investing in that specific asset. In most cases, there will be a financial summary attached (this depends on the loan originator), which would disclose financial info about the borrower and the purchaser of invoices, so an investor may know how reliable the companies are. If you understand the numbers this page will be really helpful for you to get a better grasp of the financial well being of the borrower and his customers. We want to offer investors on our platform to consider adding some of the assets from the Manufacturing industry to their portfolios. You can do it manually or use an auto-invest feature. Below are top 5 assets from the industry. After promotion our assets are often bought out in a few days, so you should not waste any time as the assets can be fully funded in no time.